There are uneven spaces between your teeth. Your teeth are worn, discolored, or otherwise misshapen. You have certain teeth that either look too large or too small. You have teeth that are noticeably crooked. What Happens During the Porcelain Veneers Process? Porcelain veneers will require at least two appointments here at Premier Dental Care. During the first visit, Dr. Bakhtyari will capture detailed impressions of your teeth and fashion a customized mold. 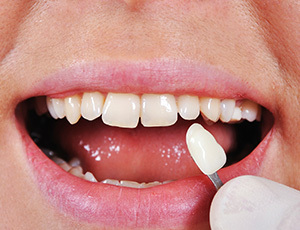 Once you have selected your ideal tooth shade and shape, this information will be sent to a trusted dental laboratory. You will have a temporary veneer attached to your smile in the meantime. Once we receive the finished restoration, you will return to the practice so that we can make any final adjustments and then bond it securely in place. This process is painless, and your final result will be naturally beautiful. Patients should keep in mind that while porcelain veneers can last for many years, they are not permanent. Your smile may need a replacement at some future date. Please care for your new veneers just like you would natural teeth with diligent brushing, flossing, and professional checkups here in Oak Hill, VA.